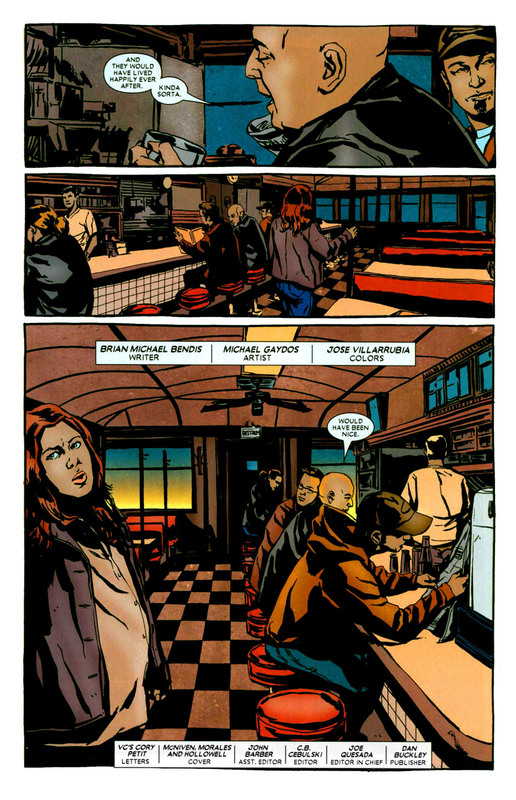 scans_daily | What if... Jessica Jones had joined the Avengers? 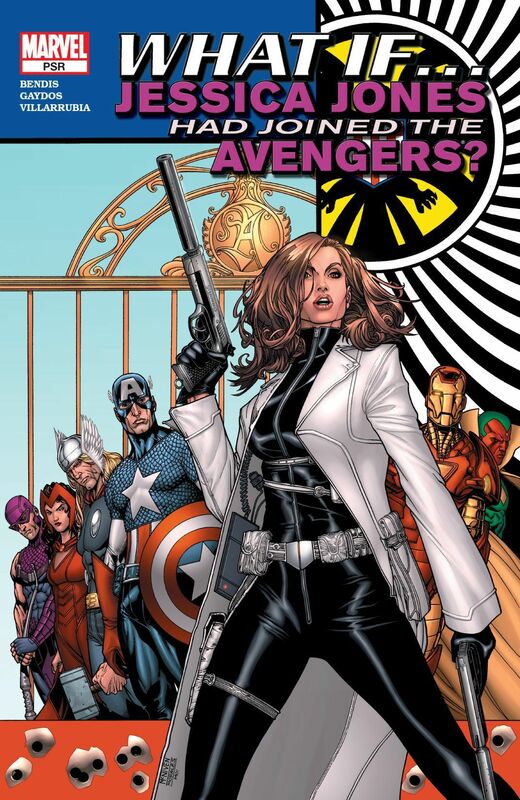 What if... Jessica Jones had joined the Avengers? 'Bendis' recounts Jessica's story and her fall from grace as a superhero, and how she turned down the Avengers' offer to join them. Jessica ends up taking him on his offer and becomes a member of the Avengers. 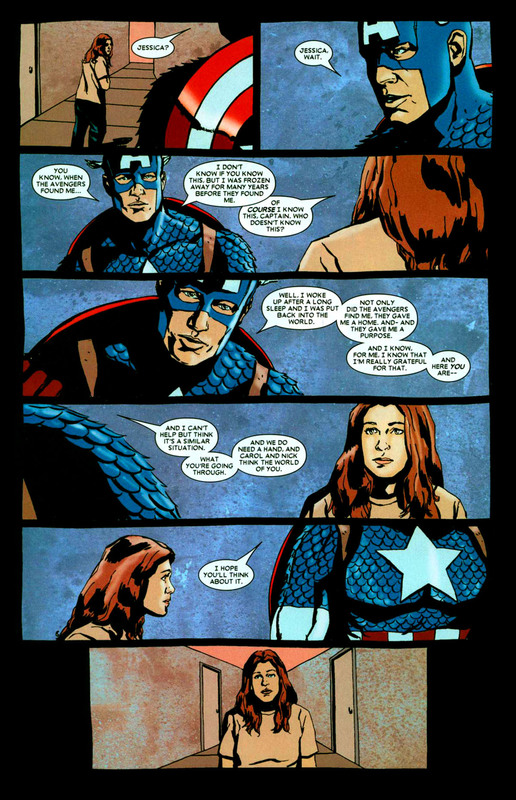 One day she hears Scarlet Witch talking to someone while alone and tells Cap about it. This whole What If? seemed sexist. 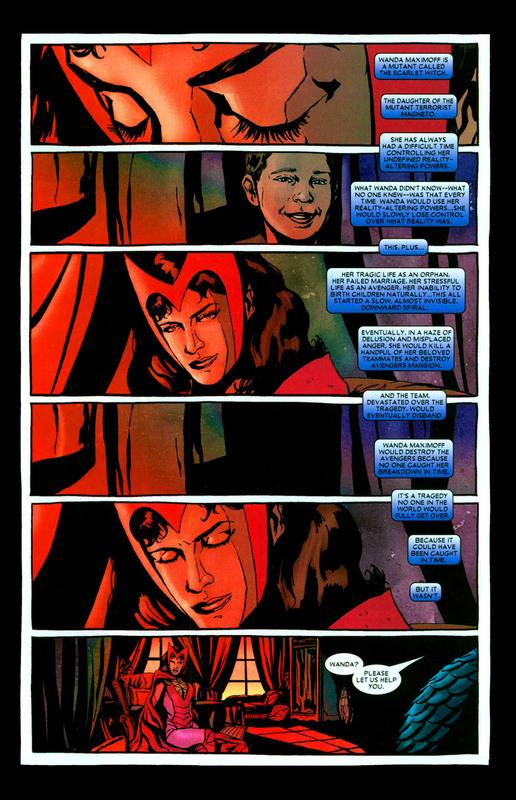 I don't know what particular aspect bothers me, maybe it's that the Jessica's happy ending revolves around getting married to a tall muscular male, maybe it's that Wanda's insanity has always seemed based on a fear of powerful women than the dangerous of magic, but there's something there. "maybe it's that the Jessica's happy ending revolves around getting married to a tall muscular male"
That's what happened with her and Luke Cage, was that sexist too? Well, considering it had more time to develop and grow, no. It was not. So it's just that she has a happy ending with an attractive male that's sexist? That implies that Luke Cage isn't attractive and i'm going to have to disagree on that. I didn't imply that, I was asking if Cap being an attractive male by itself was what they found to be sexist or if it was because she was with a man. Either way idgi. Have you seen how Luke cage makes anything he wears automatically 10% better? Now seriously. Yes. A happy ENDING, with nothing of the middle stuff. 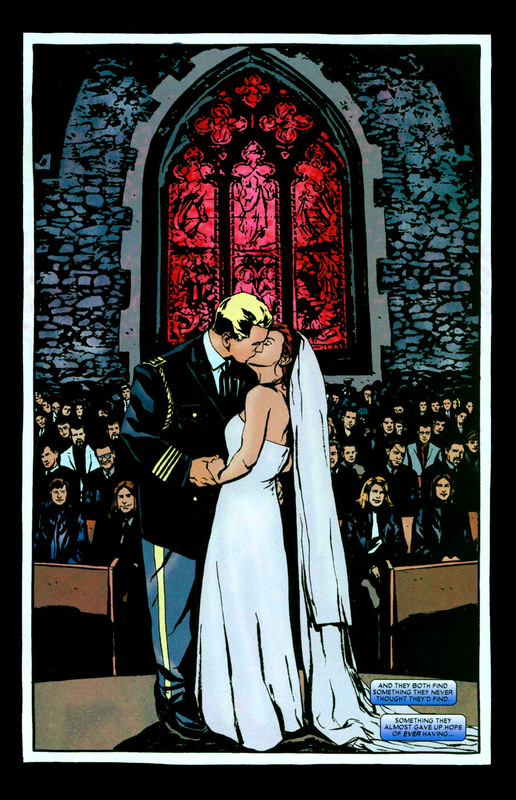 I mean, bendis made like 3 Jessica Jones series before she married Luke. It's a one-off story. I'm still not seeing the sexism. 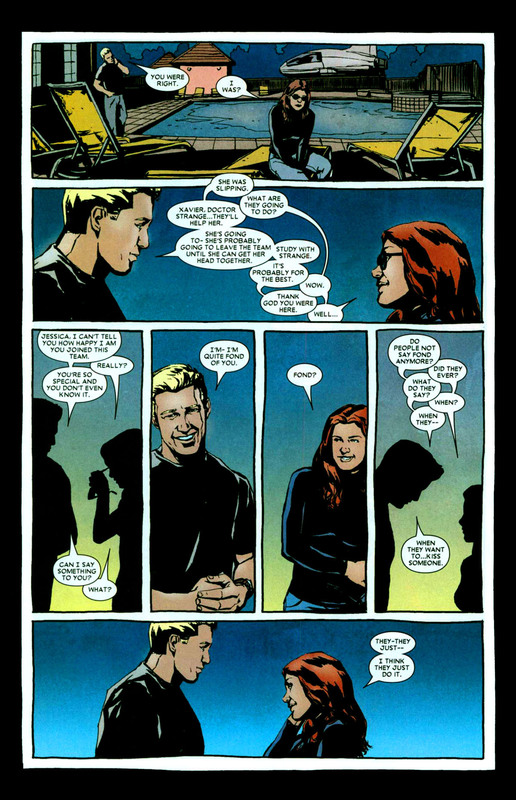 there is probably more than the scans show, but from the images alon, the issue at hand is that the story implies Jessica is better of because she married Steve Rogers. and it IS a common trope that a woman's "happy ending" is when they get "their man". Now, tropes in and of themselves are not the problem, but the execution. The execution between Jessica and Luke is really good and it doesn't treat the marriage as "jessica got her happy ending", only another step in her life. This one is... okay. nothing too bad and she and Steve do look nice together, but why was it necessary? Yeah, I thought it was ultimately "better off because she accepted the offer to join the Avengers." 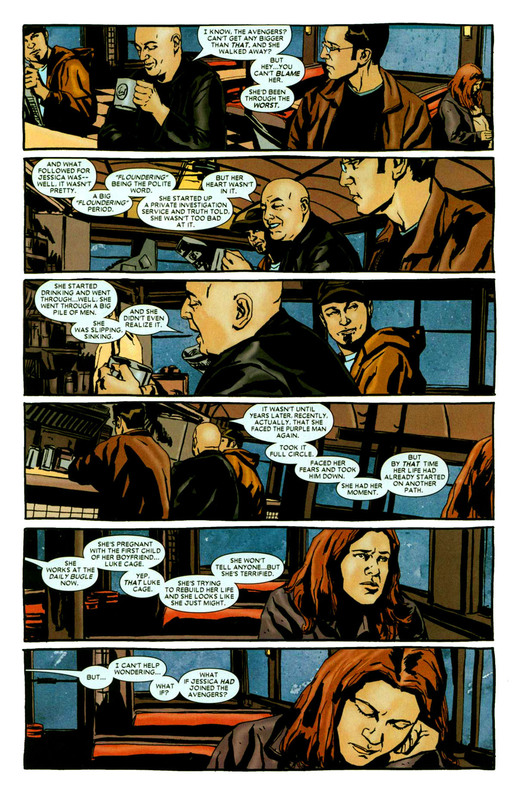 Little does Bendis know that Jessica, who's been listening to all of this, is casually picking up one of the stools there and is preparing to beat him up for sharing his fanfic ideas about her with the world. No she hasn't. And you constantly repeating it won't make it true. This is just... awkward. 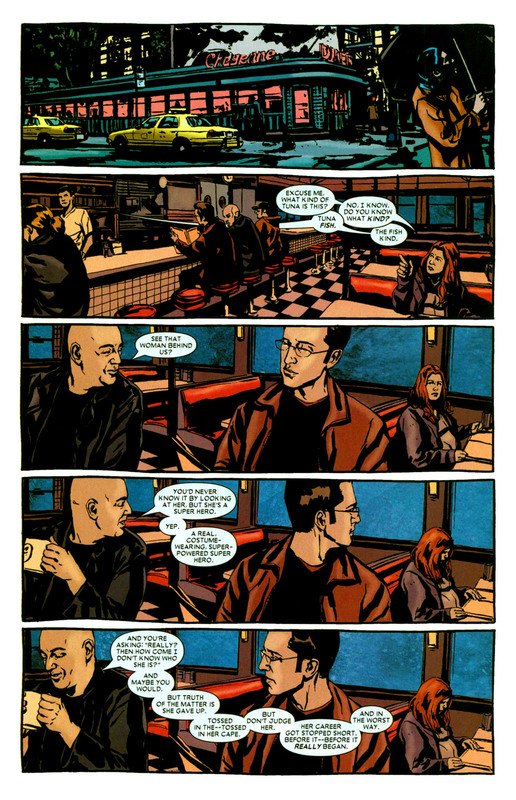 The framing device is laboured and given the events he's describing, "Bendis" constant grinning and smug expression is really, really offputting. If Uatu occasionally went down to Earth to tell everyone about his ship-fics whether they wanted to hear it or not, then I'm kind of glad Nick Fury shot him. We all know the most romantic kisses are the ones with open eyes. So what BMB is saying is his pet retconned character could have solved all the problems he created when he retconned Wanda into a mentally unbalanced woman. Somebody please explain to me again the appeal of his writing? Because I honestly don't get it. The appeal of his writing is that he's good. Also Jessica's not a retcon because her presence doesn't change anything in continuity. And isn't the reason she exists in the first place because Bendis wanted to use Jessica Drew in the series but that didn't pan out? I think Bendis has debunked that rumor. Well, naturally. After all, one of Jessica's powers is miraculously solving all personal issues. That's why she's such a happy, well-adjusted character with a Norman Rockwell-esque home life. lol IKR? I think the main reason why this story was so 'positive' for everyone involved was to contrast her depressing her life was at the beginning of Alias. Michael Gaydos drawing Norman Rockwell riffs. Honestly, I could have done with "Jessica who has struggled with major depression helps Wanda who has the same problem" but here it's more like "she happened to overhear Wanda being crazy and reported her at once". I mean, the joke is basically "This is a What-if Where Jessica gets everything she wants and everything turns out OK". Pretty on-the-nose, but at least it's a bit different than the "Everything goes to crap" What-ifs? aka 616, in her case.